Bookings are now being taken for visits to Degmo this summer. Degmo is a "not-for-profit" community company and for us to keep prices as low as possible we require a minimum of 40 people during each visit. However, we realise that it is often impossible for families to organise this many people in one group. So, to satisfy the needs of families who cannot bring with them the minimum requirement of 40 people, we now try to combine visits from several different families. Each family of up to 7 people will be provided with their own sleeping tent, but will share cooking, eating, and washing facilities with the other Somali families as well as the activities which Degmo offers. We hope this arrangement will help more Somalis to visit Degmo. How much does it cost to visit Degmo? Prices include accommodation, food, use of cooking and washing facilities, and activities. There is a minimum stay of two nights. All families will have their own sleeping accommodation. Adults - £35 / night. - A box of fresh local potatoes, carrots, onions, garlic, tomatoes, cabbage and whatever other vegetables are in season. Also bananas and fresh ginger. - Local organic stone-ground wheat flour- unbleached white & wholemeal - for making Somali Laxoox, baked bread and pizzas. - Tea leaves and spices such as cardamoms, ginger, cloves and cinnamon for making Somali tea. - Organic milk and butter. Cheese. Fresh eggs from the neighbour’s farm. - Fresh organic goat's milk. - Goat's milk is raw and can therefore only be legally used in the making of Somali tea where the entire brew is boiled. Any extra foods you require, such as soft drinks,sweets, biscuits, and breakfast cereals we ask you to bring with you yourselves. Kington, the nearest town, is 6 miles away and has good local shops and a small Co-Op supermarket. Opening times are normal trading hours - not 24 hours!! We ask you to cook your own food in the large well equipped kitchen area which has enough plates and cups etc to feed 36 people. There is full sized 8 hob gas catering cooker and oven as well as an open fire on which you can cook. We will be on hand to assist you with this. In 2016 we introduced a new wood fired oven in which we cook pizza, bread and roast meats. A member of staff from Degmo will be available to help families prepare and cook their own fresh pizza! For accommodation each family is given their own 5m. diameter Aqal style tent equipped with insulated ground sheet, mattresses, pillows, single sheets and blankets for each person. For your comfort and convenience it is essential that you bring with you some additional bedding, such as a duvet quilt or sleeping bag, as well as a torch, waterproof coats and strong shoes for walking on rough ground. Those who arrive without additional bedding may hire sleeping bags and sheet liners at £5.00 per person per visit. This price is to cover the cost of laundry and service. For washing there are two spacious hot showers and basins and three toilets provided for use on site. For reasons of cost, we cannot always provide private families with all the activities we offer to community groups who pay extra for this service. However, we will do provide as many activities as possible, especially those related specifically to Somali culture, and can guarantee families full access to the on-farm activities such as goat milking, sheep handling, and cows. 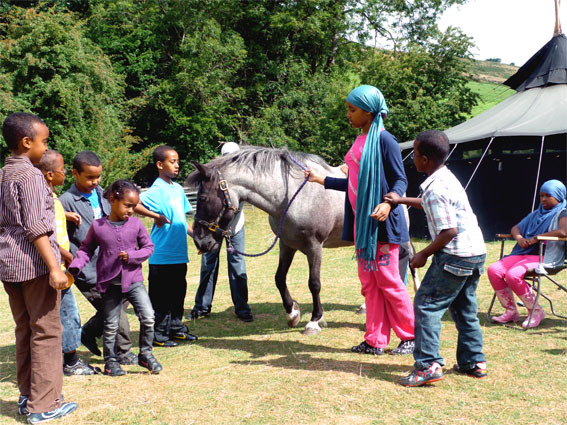 Horse riding is available at a local riding centre. Each horse costs £19 for one hour. Normally two people of similar sizes share the same horse, each person riding for half an hour. Riders must be 5 years or older. All safety equipment is supplied. Canoeing on the river Wye can be booked for groups of 10 or more people. Prices are for half a day, including instruction and hire of equipment. Alternatively individuals and families can hire their own canoes and paddle down the river independantly of any group and without the need for an instructor. Please call for details. Part of the appeal of coming to Degmo is the peacefulness and unspoilt beauty of the countryside and lack of houses, roads and people. However it also means that there is no public transport! So visitors must arrange their own transport. If several families are travelling together in private cars, please try to arrive at the same time, or better still, hire a minibus which will fit more people. Coaches. Due to the very small road which leads to the farm we cannot accept large coaches. Minibuses can fit easily up the road and it is also possible for some smaller coaches of around 30 seats to reach the farm. When visiting Degmo we ask that you arrive during daylight hours. This allows us to safely show you to your accommodation, explain how the facilities function and settle you in before dark. It also minimises disturbance to our neighbours who live at the bottom of the road along which visitors must travel to reach the farm. Without their co-operation Degmo cannot continue to function. When navigating to the farm using sat-nav systems please be aware that the machine may stop you at a neighbour's house before you have reached Degmo. To avoid this, and inconvenience to our neighbour, ignore your sat nav's instructions that you have arrived at your destination and continue up the road until it ends at our farm. Please inform us immediately upon arrival of all medical conditions or allergies that any of your group may be suffering from and give details of medications they are taking or have available for their condition. This is so that, in case of an emergency, this information is available to our trained first aider and any emergency services which might be called to attend. We always like to talk. Please call if you want to know more about Degmo, what we offer, and for availablity and bookings. To contact us go to the "Contact" page and call the numbers listed, or send an email. Please be patient if we don't answer first time. 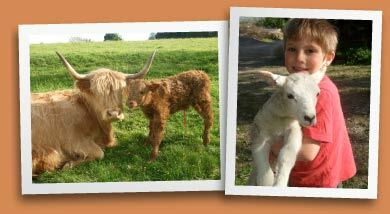 We might be busy with the sheep and cows, driving the tractor, or dealing with our children! A 50% non-refundable deposit is required to secure any booking. For community organisations, youth groups, schools, Mosques, and other social and religious instituions we offer a more comprehensive service which can be tailored to the specific needs of those concerned. Please call or send an email for further information. Before Degmo opened in 2008 we spent many months researching ways to accommodate our visitors. We wanted a camp - a Degmo - which in some small way reflected the Somali nomadic tradition of using tents which can be erected, dismantled, and transported with ease. 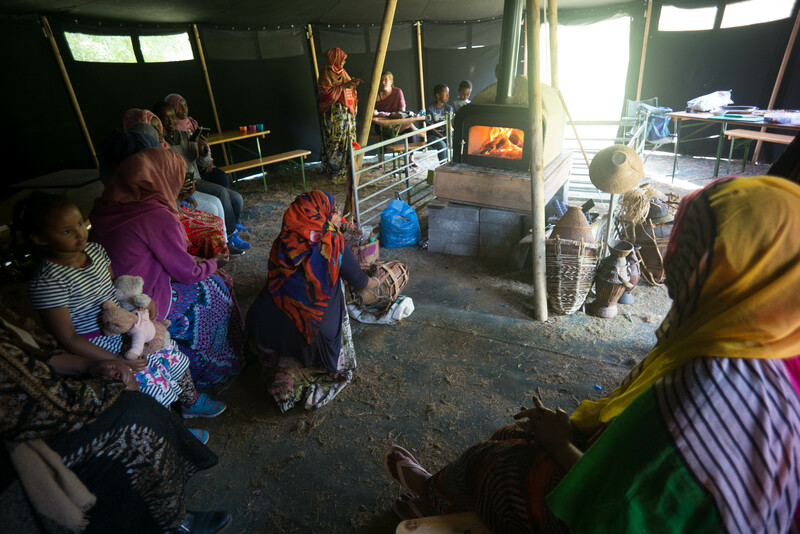 As is the case in the Somali region, we also wanted our visitors to be close to nature: to hear at night the sound of animals through just the wall of a canvas tent. At the same time we did not want people to be uncomfortable and so we had to consider the problems of unpredictable British weather and how well the accommodation we provided would survive wind and rain as well as sunshine. That ruled out using traditional Aqal Somali style tents which are not suited to long periods of wet, damp weather. Instead we found that heavy-duty canvas bell tents are the best accommodation for families to sleep in, whilst two huge, round, black tents joined together were ideal for the main communial area. In these are situated the kitchen, the fire, and the pizza oven, and it is here that we eat, socialise, hold talks and do demonstrations. 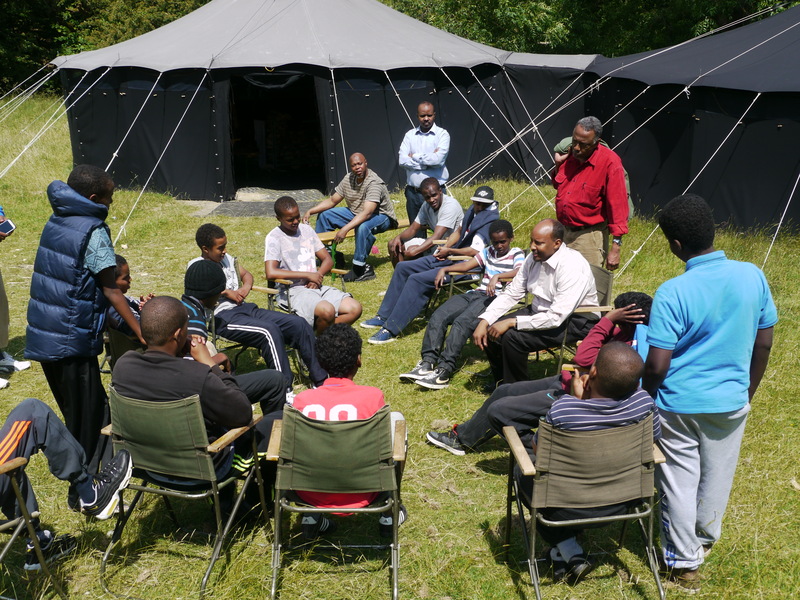 Abdirashiid Mahamed Saeed Dualleh, CEO of Dahabshiil, chats to young Somalis from Sheffield seated outside the black tents which he donated to Degmo in 2008. Our black tents have served us well, but are now on their last legs. Even after repairs, they will only survive one more summer of use. We therefore need to find replacements. The black tents have been good, but are far from perfect. They are difficult to erect and take down, when the weather is bad they are hard to keep warm, and they have lots of guy ropes which are a trip hazard. 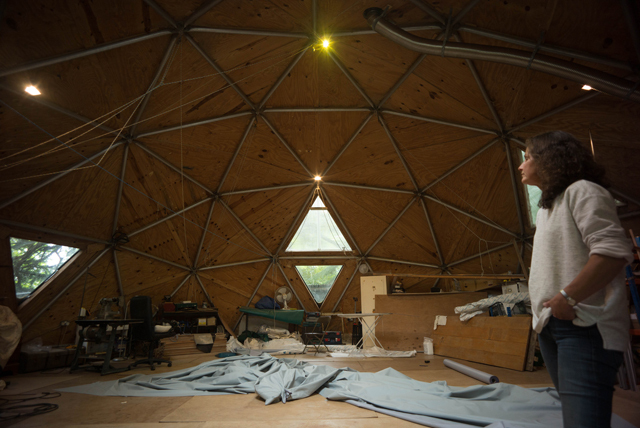 So, after more research and consideration we have decided to replace the black tents with a giant geodome! 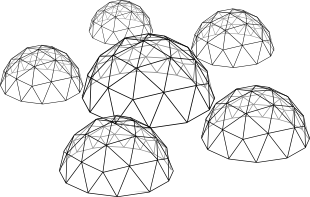 Geodomes are very clever structures. In fact they look and feel a little like a traditional Somali tent, only instead of useing flexible hoops to create a domed roof, they use struts locked together to form a strong, rigid, triangular framework which can be covered with canvas or any other weatherproof material. Inside there is no need for supporting poles, nor do they require guy ropes to stop them blowing away. Fortunately for us, not far from Degmo, we have Geoff Garratt, one of the UK's foremost designers and builders of geodomes. He is able to make a geodome specifically suited to the needs of Degmo. Indeed, so impressed are we by the possibilities for these structures, that we are investigating if it is feasible to design geodomes that can be made and used in the Somali region. To finance the purchase of a geodome for Degmo we need money! 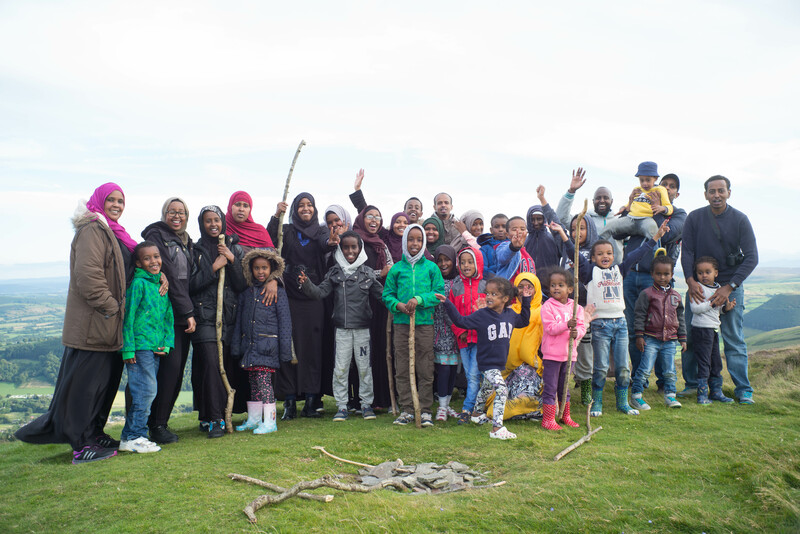 Since recession hit the UK and caused the closure of virtually all the Somali community groups and youth centres which, supported by local grants, brought many hundreds of visitors to Degmo, we have had to reduce the prices we charge to a level that is more affordable to private families. This has ensured that Somali families still can come to Degmo and that the project has survived, but it has left us severely short of money. We must therefore ask our friends, both private and in business, to help support the purchase of a geodome which will replace the black tents. Just because it's freezing it doesn't mean everyone is suffering. With her special dual coat of hair, Millie, one of our oldest Highland cows, is totally at home in the snow. So well insulated are they from the cold by their furry coats, that when ice and snow land on their backs, it remains frozen. 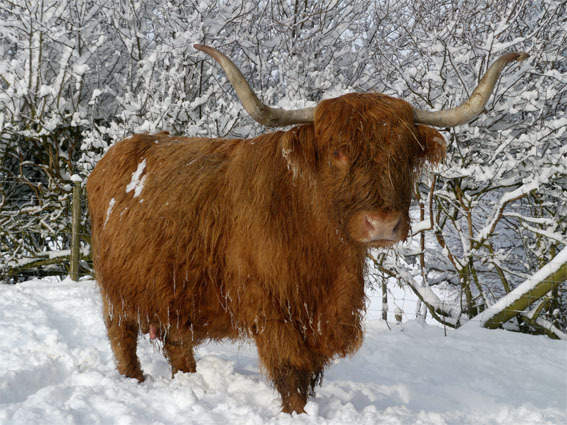 In the same way that camels in the Somali region are perfectly adapted to the hot dry climate, Highland cattle are supremely well suited to the cold and so long as the cows have plenty of hay and water they can survive perfectly happily outside no matter how severe the weather. This year's fine crop of healthy lambs and their mothers are now enjoying rich spring pastures on the hill. As lambing ends, calving begins, and already there have been two births.